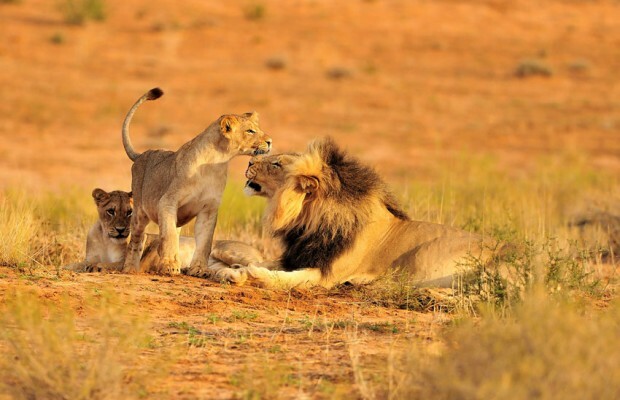 Second only to Katavi in its aura of untrammeled wilderness, but far more accessible, Ruaha National Park protects a vast tract of the rugged, semi-arid bush country that characterizes central Tanzania. Its lifeblood is the Great Ruaha River, which courses along the eastern boundary in a flooded torrent during the height of the rains, but dwindling thereafter to a scattering of precious pools surrounded by a blinding sweep of sand and rock. 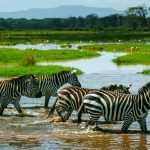 A fi ne network of game-viewing roads follows the Great Ruaha National Park and its seasonal tributaries, where – during the dry season – impala, waterbuck and other antelopes risk their life for a sip of life-sustaining water. 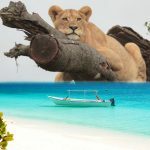 And the risk is considerable: not only from the prides of 20-plus lion that lord over the savannah, but also from the cheetahs that stalk the open grassland and the leopards that lurk in tangled riverine thickets. This impressive array of large predators is boosted by both striped and spotted hyena, as well as several conspicuous packs of the highly endangered African wild dog. Ruaha’s unusually high diversity of antelope is a function of its location, which is transitional to the acacia savannah of East Africa and the miombo woodland belt of Southern Africa. Grant’s gazelle and lesser kudu occur here at the very south of their range, alongside the miombo-associated sable and roan antelope, and one of East Africa’s largest populations of greater kudu, the park emblem, distinguished by the male’s magnificent corkscrew horns. A similar duality is noted in the checklist of 450 birds: the likes of crested barbet – an attractive yellow-and-black bird whose persistent trilling is a characteristic sound of the southern bush – occur in Ruaha National Park alongside central Tanzanian endemics such as the yellow-collared lovebird and ashy starling. Fourth Largest National Park in Tanzania. Shares boundary with Selous Game Reserve in the southw hich is transected by the main road from Dar es Salaam to Iringa. Animals migrate between the Mikumi National Park and the Selous Game Reserve. Lions, Buffaloes, Impalla, Gazelles, Elephants, Giraffes can be found in the National park an hippoes and crocodiles in the rivers. Over 400 bird species resident in Ruaha National Park. Covers an area of about 3,230 sq km (1,250 sq miles). Climate is tropical and the park is accessible year round. The best time to visit the park is during the dry season which is June through February. During the rainy season (March through – May) some of the park roads may be impassable. Safari drives within the national park with 4×4 vehicles. Guided walks in selected areas. 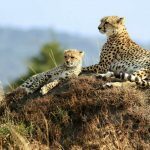 Visit the nearby Selous Game Reserve are Udzungwa Mountains National Park.